Taylor was fishing with her Dad on Sunday, August 6th, at about 3pm when she caught this rock bass. She was fishing with a jig on the east side of the lake near Dakota Shores. 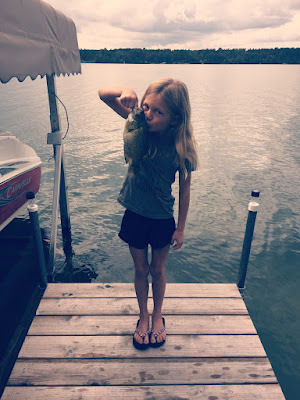 Taylor says she likes to fish with her family and likes learning more about all the types of fish in the lake. The Kid's Fishing Contest runs until three days before the next Annual Meeting in June 2018, so take your pictures and email them to us.